What is clear is that when undocumented immigrants – farm workers, hotel workers, and household and restaurant staff lacking green cards or other legal status – do pay into Social Security, they often have little prospect of ever receiving benefits. In 2010, some 3 million such workers with fake or expired Social Security numbers added a $12 billion bonus to the Social Security Trust Fund, the U.S. Social Security Administration estimated. But a new study of Mexican immigration between 2005 and 2011 shows an abrupt end to what had been steady increases, year after year, in the number of these undocumented workers crossing the U.S.-Mexico border and adding to the Trust Fund. 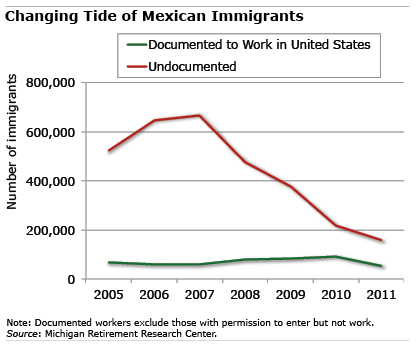 In the wake of the Great Recession, the inflow of undocumented workers slowed sharply to about 159,000 new Mexicans migrating and seeking work in 2011, down from a 2007 peak of almost 670,000. The study was based on Mexican government surveys taken in bus depots, airports, and train stations in northern border cities. Meanwhile, the flows of documented workers who make numerous trips back and forth across the border increased during the same period. These immigrants are more likely to one day become eligible to collect Social Security pensions. It’s impossible to predict how these trends will develop amid a strengthening U.S. job market and divisions over immigration policy. But as the researchers noted, it’s an interesting trend that bears watching. If $12 billion is the estimated bonus for 2010, what is the accumulate effect in the Social Security Trust Fund? This is true. But there are also a significant number of undocumented immigrants collecting Social Security and other benefits via identity theft. What is the offset point?